The ArcLite Simplicity Glove set is great for beginners. 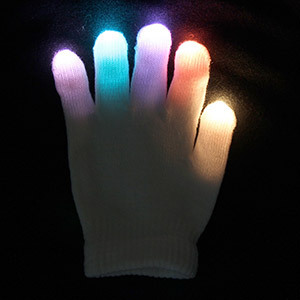 Each finger contains a programmable ArcLite Simplicity light letting you make your own color mix from over 20 colors. Once you pick your 6 colors you can cycle through 3 cool modes that mix your colors. Simply click once to turn on the light. Each single click changes to the next mode. When you find the mode you want to change the colors on, simply press and hold until it turns to low-power orange. You are now in programming mode. Now click until you see your desired color. Press and hold down to see the three brightness levels for that color. Simply release the button on the brightness you want. You have just programmed your first color and brightness for that mode! Now, you can program the low-power orange to end programming or simply click through to the next color. You can program up to 6 colors for each mode. You can program a BLANK instead of a color to add a space. You can get creative by adding multiple BLANK spaces to extend the strobe frequency. The BLANK counts as 1 of the 6 colors. 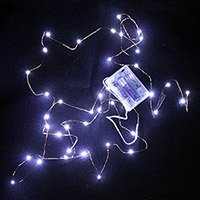 When you are done programming, your colors and brightnesses will be saved in memory even if you remove the batteries. Glove set uses 20 CR1620 batteries (included and replaceable).